Perfect. Another clown teaser for "American Horror Story: Freak Show." Or is this one the "official" look at the monster that's sure to haunt your dreams starting October 8 at 10 p.m.? 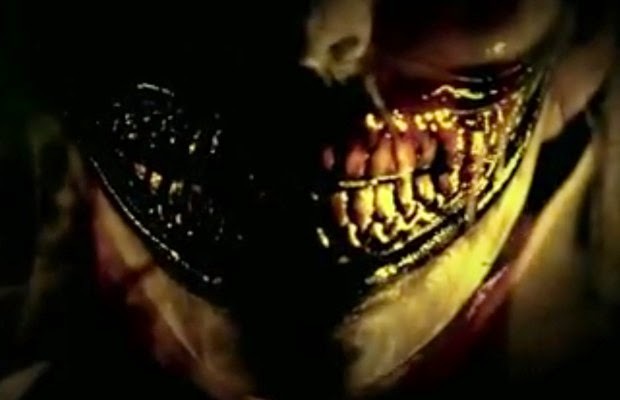 His "Twisted Smile" is available for you to check out below and was recently posted on the official AHS Facebook page. The video and photo, however, are courtesy of Bloody Disgusting. It's hard to keep up with these gems and I sometimes wonder if they're legit or fan-made. Regardless, they are all pretty cool and seem to be working to get fans pumped for the show. Are you digging the teasers or have you had enough? Be careful how you answer...this guy might come after you. “American Horror Story: Freak Show” begins its tale in the quiet, sleepy hamlet of Jupiter, Florida. The year is 1952. A troupe of curiosities has just arrived to town, coinciding with the strange emergence of a dark entity that savagely threatens the lives of townsfolk and freaks alike. This is the story of the performers and their desperate journey of survival amidst the dying world of the American carny experience.